Eliminate Full Price: Super Sunday Savings @ CVS: How I spent $15.41 on items worth over $50! Super Sunday Savings @ CVS: How I spent $15.41 on items worth over $50! Sunday was hot but I sneaked in a few cool moments at the air conditioned CVS. I was able to buy over $50.00 worth of items for $15.41! Plus I got $7.99 Extra Care Bucks (ECBs) from the Celsius drink, $2.00 ECBs from the Tide, $2.00 ECBs from the Tylenol Precise, $1.00 ECB from the M&M Pretzel's, and $1.00 ECB from it being my 4th green bag tag scan. Did you notice how I rolled my previous $13.96 in Extra Care Bucks into a new batch of $13.99? That is what helps me in saving so much at CVS. It's like I only paid for the Tide and Biore moisturizer and got everything else for free! 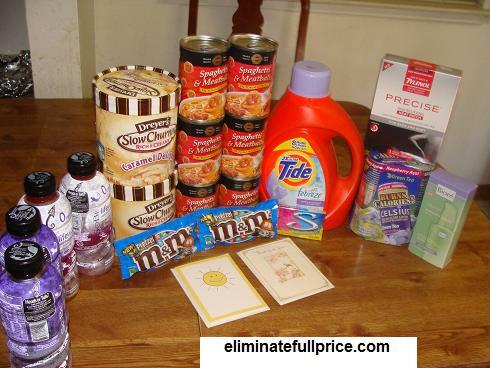 I love CVS-ice cream, Tide, tylenol and so much more for only $15 with ECB's back! Thanks for linking up with Tuesday's Trips!